A couple of years ago, I discovered that two of my college friends from Northwestern University, Maureen Dunn and Michelle King, owned a Fair Trade Clothing Line called Mata Traders. Soon we figured out that the Tiny Pine style could have a place within Mata… I helped out with some design for the tags, catalogs and logo redux. Then Maureen asked me if I wanted to try my hand at actually designing some of the clothes. The cooperatives in India that Mata Traders works with do a lot of applique work and hand stitching. This made me really smiley because I knew that anything I would come up with would be treated with love the way all handmade products are. I was super proud to do some applique design sketches for Mata, and then they translated within their block printed clothes. 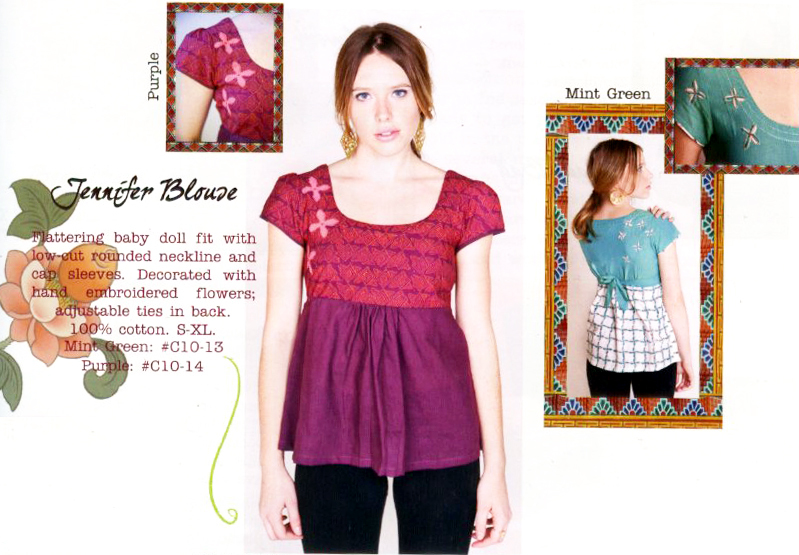 This shirt, which they so sweetly named the “Jennifer Blouse”, was one of the pieces I worked on. The collection will be available sometime in late April… keep your eyes opened at your nearest fair trade clothing shop! This entry was posted in art, stitching, Uncategorized and tagged Jennifer Parsons, tiny pine on March 21, 2010 by tinypine.